英文摘要：Ti-6Al-7Nb bars with three type initial microstructures(including fine equiaxed, ordinary equiaxed and basket-weave) were prepared. And the effects of solution temperature, aging temperature and aging time on mechanical properties and microstructure of Ti-6Al-7Nb alloy were investigated. The results show that the strength increases with the increase of solution temperature, while plasticity decreases. However, strength drops sharply. With the increase of aging temperature, the size of equiaxed alpha phase increases obviously, but volume fraction is keeping stable. The peak strength is obtained at 550 ℃. During aging process at 600 ℃, ultimate tensile strength increases with aging time increasing, and yield tensile strength keeps stable, and plasticity drops. The results also show that equiaxed alpha phase increases plasticity while lamellar alpha phase is good to strength. 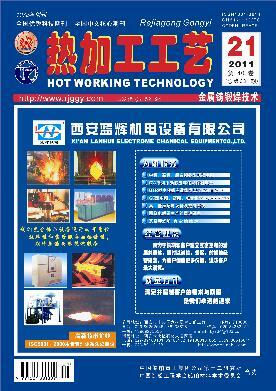 The best heat treatment process is: solution at 940 ℃ for 1 h, AC and aging at 550 ℃ for 4 h，AC. The plasticity of basket-weave initial structure should be improved by some methods for industrial application.